The villa is located at about 4 km from Sorrento and at about 4 km from the village Sant'Agata Sui Due Golfi. On the road that connects these two towns, you will find the automatic gate that will allow you to enter to the villa. Although there is private parking, you will not need the car to stay at villa Bianca as the bus station to Sorrento, Positano, Amalfi is at only 5 meters away. The nearest restaurant and bar are at 200 meters distance. From the main road, through an automatic gate, you will enter to the villa. Having parked the car, to reach the entrance of the villa you will have to climb about 30 steps. Upon entering you will find the large living room equipped with one double sofa bed and satellite television; follows the kitchen area equipped with table and chairs that can accommodate 12 people. 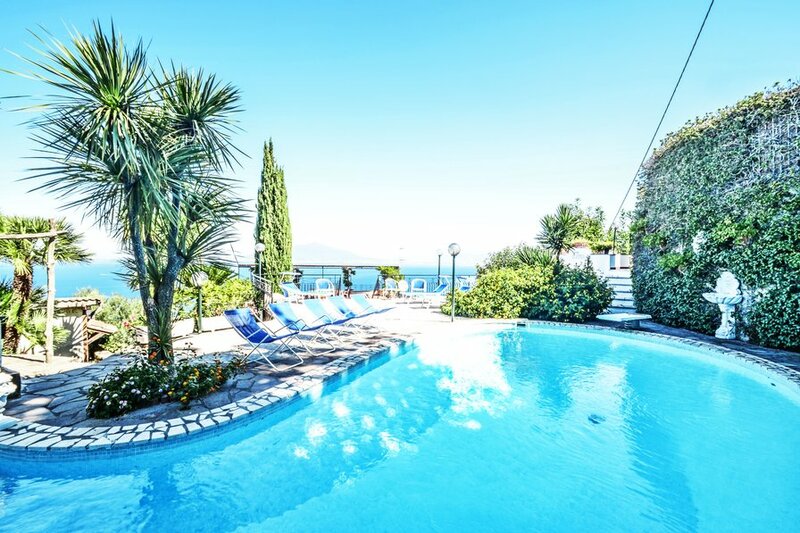 From these areas, you will have the direct access to the first large terrace (equipped with table, chairs, deckchairs, beach umbrella and automatic tend for shelter from the sun) with view on the Gulf of Naples, on Vesuvius, Sorrento and Capri Island. The bedroom area consists of 3 spacious and bright double bedrooms each of which has the same panorama as the terrace and the access on a balcony with sea view as well. There are 2 bathrooms: one with tub and one with shower. From the entrance area you can also reach a small room used as a gym (equipped with some tools to do exercises) with sea view, and the upper area where you will find the swimming pool (with outdoor shower and a small bathroom) of about 70 square meters, the barbecue area (where there is a wood oven for pizza and a small kitchenette), the solarium of about 120 square meters and another huge equipped terrace of about 140 square meters with breathtaking sea view. This is undoubtedly the most beautiful area of the villa where you can spend unforgettable days enjoying the swimming pool, the view of the sea and the Gulf or a pleasant breakfast or dinner. THE ANNEX has 2 double bedrooms with 2 ensuite bathrooms. Each room has the TV, the refrigerator and the Internet WI-FI. The annex also has the terrace with the view of the sea. You can reach the annex from the main villa climbing 7 stairs.